Hiroko had never been north of Tokyo. When she mentioned to Kosuke Kuji　（久慈浩介）, the 5th generation of Nanbu Bijin Brewery (南部美人酒造）in Iwate, Kuji-san invited her to his brewery. Nanbu Bijin Brewery is located in Ninohe （二戸）, Iwate prefecture in the Tohoku region about 3 hours from Tokyo by rail, and the second to last stop on the Tohoku Shinkansen before Hachinohe, Aomori prefecture. With a population of about 31,400 (in 2006) it is rather small city which still has the remains of the historic Kunohe Castle (九戸城） and the famous Kindaichi Onsen (金田一温泉). 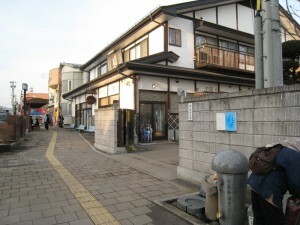 Among its restaurants is the legendary soba restaurant Maita Koubou Sobae-An (米田工房そばえ庵）, the hard-to-get-in yoshoku Restaurant Bonheur, （レストラン・ボヌール), and an extremely famous ramen shop, and several late night drinking spots. Anyone who is familiar with Japanese language may get confused about the name Nanbu Bijin (南部美人). Translated as Southern Beauty, one may wonder why the “Nanbu” (南部) or Southern when the brewer is located in the northern part of Japan? “Nanbu” comes from the name of the Nanbu samurai clan which originated in Northern Japan, mainly in what was once known as Mutsu province (which now encompasses present-day Fukushima, Miyagi, Iwate, and Aomori plus some parts of Akita). Descended from Emperor Seiwa (reign 858-876), Minamoto no Mitsuyuki (1165?-1236?) of Kai province (Yamanashi prefecture), took the name “Nanbu” from the town where he lived changing his name to Nanbu Mitsuyuki. He is said to have moved to Mutsu province around the time of the Oshu War (奥州合戦) in 1189. Over time, the Nanbu became the dominant samurai clan in the Mutsu area and built their castles as they established themselves in the area which is how the Nanbu name came to be associated with this part of a Iwate. 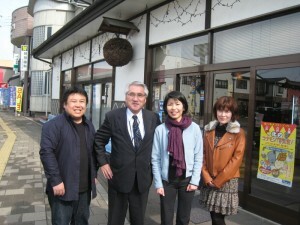 Kuji-san is an energetic young man in his 30′s whose ebullient personality casts sunshine on the sake world and beyond. He has been to New York City to promote his sake many times, and has enthusiastically encouraged many sake fans to become Nanbu Bijin lovers. He is also a risk taker and revolutionary in terms of developing new products with a spirit akin to the samurai Nanbu Mitsukuni who made the bold move to very far north from where he was born. Seeing the popularity and trend of umeshu or plum sake/liquor, Kuji-san has created a non-sugar added umeshu. 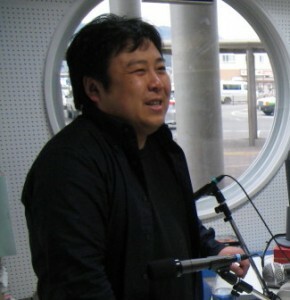 The journey started when his wife Rika suggested mixing his “All-Koji Sake” with kiwi or strawberry to make a fruit cocktail. This all-koji sake was a early brainchild that he created in 1998, and it is now a staple of the Nanbu Bijin lineup. It is made from just three ingredients: koji (koji-mold affected rice), water, and yeast starter instead of the four ingredients usually used for making sake: rice, water, yeast, and koji. Koji-mold’s job is to break down the rice starch into the simple sugar, glucose. Therefore, koji (rice inoculated with koji mold) has a high glucose level. This “All-Koji Sake” has a little sweetness that makes it a good mixer for a fruit cocktail. After his wife’s inspiration, Kuji-san had his “ah ha!” moment. He theorized that the all-koji sake could be infused with ume (Japanese plum) to make an umeshu that is naturally sweet. He tweaked his all-koji sake, and using the koji’s natural glucose level, he successfully create the umeshu that needs no additional sweetener. His search for the perfect ume for his product led him to a local farmer in Iwate prefecture. He also found a young local artist to design the label for the product. He patented the process in 2009, and his umeshu now sells briskly…his February released umeshu is almost sold out. Look for it in the U.S. by October of this year. Kuji-san’s samurai spirit inspired umeshu is sure to cast its spell on umeshu fans here too! Spring brings with it some great seasonal namazake (unpasteurized sake) and one of the most highly anticipated arrives in New York next week (the week of 3/21/10). Masumi Junmai Ginjo Arabashiri from the Miyasaka Brewing Company in Nagano will debut not only at SAKAYA at our tasting on Friday, March 26 (6-8PM) but also at two restaurant events where the brewer will pour and speak about their sake. Don’t miss the opportunity to taste the Arabashiri and as well as the other fine sake from this legendary brewery! At the end of this month, the much-anticipated Masumi Arabashiri Namazake from Nagano arrives at SAKAYA and at selected restaurants in NYC. An early spring seasonal unpasteurized sake (namazake is unpasteurized sake), it has become a favorite of many of our customers and has won fans among sake enthusiasts and neophytes alike. What is arabashiri? In the latter stages of the sake brewing process, the fermented mash of rice, water, yeast and koji, called the moromi is pressed to separate the liquid (sake) from the solids (sake kasu). This pressing portion of the process has three stages and the sake from each is earmarked for separate bottlings. Arabashiri is the first stage which yields a sake that has a bright, zingy, fresh taste. Arabashiri is followed by Nakadori (middle stage) and Seme (the last stage). We’ll also be featuring two exquisite sake, Kanbara “Bride of the Fox” Junmai Ginjo and Tentaka Kuni “Hawk in the Heavens” Junmai, from Hiroko’s recent six kura itinerary in northeastern Japan on March 12 and a tasting of one of Saga prefecture’s finest sake, Azumaichi Junmai, on March 20. 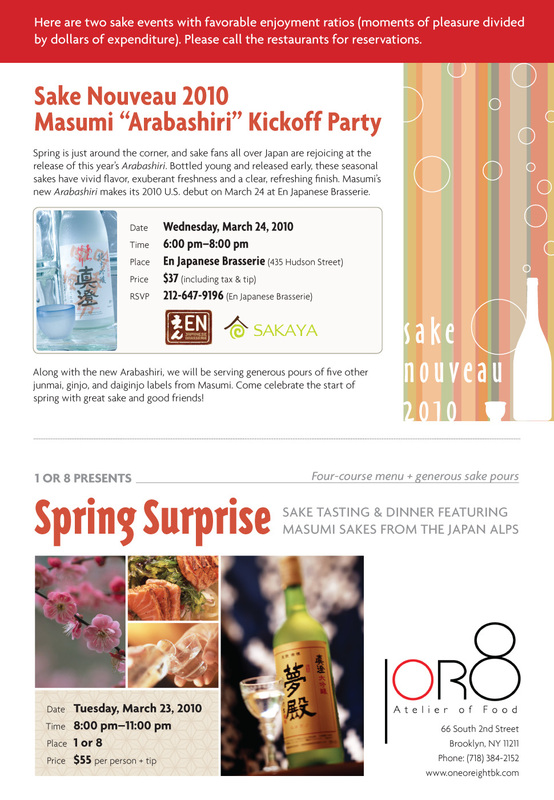 We hope that you can join us for one or all of these memorable sake experiences! 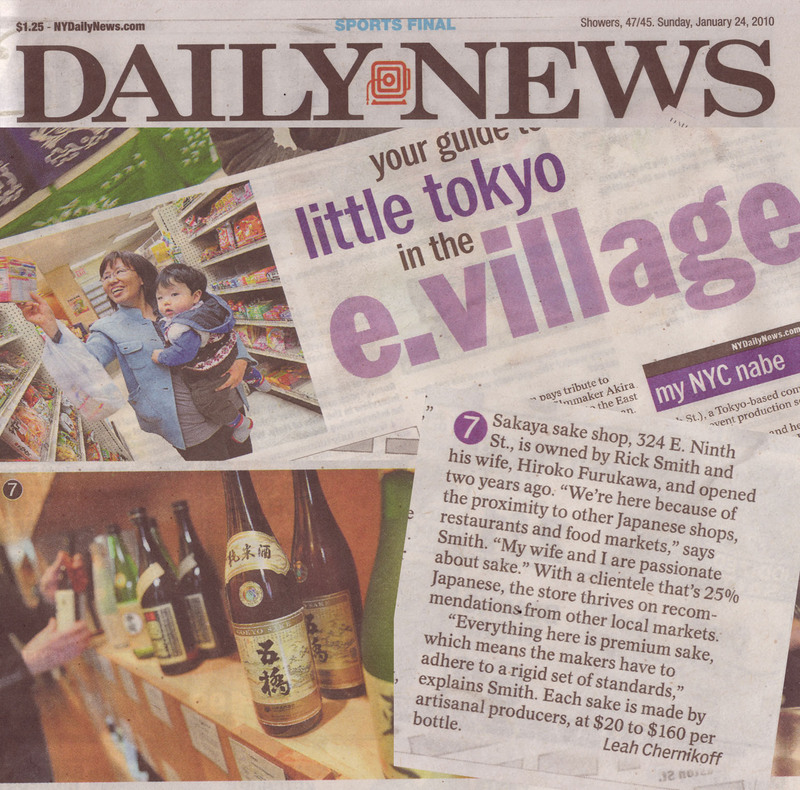 We were very happy to see the Daily News (1/24/10) include SAKAYA in their two-page spread shopping guide to Little Tokyo in New York’s East Village. You are currently browsing the Sakaya NYC Blog weblog archives for March, 2010.